Next step in our fresh start is gearing up for our neighborhood tag sale this weekend! I can't wait to put all our crap beloved belongings that we just don't have room to store up for sale. And hopefully we'll make some yarn money spending money for our anniversary trip next month. So I guess that's it. I knew I didn't have much to say, but it's been almost a week so I felt like I should post. Well, there is one more little thing. I'm thinking about offering my services to create buttons and banners for bloggers who wish they had one but don't have the time, patience or software to do it themselves. What do you guys think? I am by no means a professional, but I think it's something I might like to try. Do you think anyone would be interested . . . or do people figure why pay when you can create your own for free? I say YES! Offer yourself! I am interested.........still! Do you have a winder? Need to send you something...........special...........really! Those socks look great! Aren't they a quick knit? LOVE them. Your socks are looking good! That yarn could not be more perfect for the project. The green of those socks reminds me of spring, at least spring in a place where it isn't rainy and gloomy. I'd go ahead and offer a button/banner blog enhancement service. What's the worst that could happen? Nothing. What about being open to barter? Trade yarn for blog art. Yes! Yes! Yes! I already want to hire you to do my banner, buttons, and can you do galleries? I love your embossed leaves socks. They are coming out so great. I definately think you can offer your buttons services. I totally understand the family stuff. I feel like I am in a never-ending circus sometimes. As for the socks, they are so PS-May! I like the yarn and color choice. And last, I would be one of those in need of button services. My DH created the one for my site, and I am trying to think of one for the "Walk, then Knit" page. Great idea Karen! I had always wanted to do banners and buttons, but I always managed to do them for free and figured I'd never make any money at it! lol I think you will do fantastic with it :) Hooray for you!!!!!!!!!!!!! ;) Your socks are gorgeous and I'm so happy that Mother's Day turned out better than expected! I too hope the sun will come out soon, it is getting terribly depressing now. Enjoy your sock knitting and good luck at the tag sale! Oh cool- you should totally offer your services. Everyone needs an interesting button! 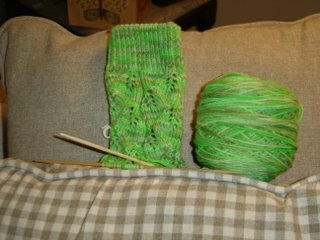 I like your socks- I just started the same ones, but I'm not sure if they'll look ok in my colorway. Yours are coming out really nice! What yarn are you using? I'm so glad to hear that Mother's Day went well with all four parents - it's often that we dread things and then they miraculously work out so much better than expected! I love how your socks are coming along, I'm still totally amazed by the colorline you're using, it rocks big time! Your socks are looking fantastic! The colour suits the pattern very well! Good luck with the weekend selling too. I am glad to hear that your Mother's Day went well! PHEW! The color of those new falling leaves socks is so wonderful! I love it! I also think that you could create buttons for all those out there who do not have the time, program or any of that good stuff! The yarn for those socks looks just like apple Jolly Ranchers! Yummy. Glad everything went well on Mother's Day, and I hope the truce lasts! I say go for it. I am trying to save some money for a puppy by selling some of my knit stuff off my blog...read mostly by knitters...it could happen! Move along, nothing to see here . . .